1,000 jobs come with Smithfield Gateway project - Legend Properties.Inc. A parcel of land east of Route 209 in Smithfield Township will change hands this week. The 29 acre property, located between Dairy Queen and the Odd Lot store, is located just off the Marshalls Creek Exit. It is being sold to Legend Properties, Inc. for million. The development company will seal the deal on Monday, said CEO James DePetris. 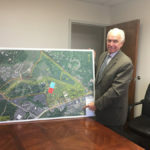 His company will then have acquired a total of 120 acres in Marshalls Creek for 0 million worth of development in Smithfield Township. Legend intends to use the site for the Smithfield Gateway: a proposed multi-use commercial shopping, business and residential apartment complex.